From his daily walks with his dog along the foreshore in the 1960s and 70s, Ernie became an expert in the archaeology and history of the river. He also became a tireless campaigner against the “reclamation” of the foreshore as property developments replaced former dock activity. Thanks to Ernie Coin Street Action Group campaigned to save the existing river wall and beach and persuaded the Greater London Council to drop its requirement to build out to ‘the Port of London Authority line’. This has resulted in the sandy ‘bay’ that can be seen today and is now being named Ernie’s Beach. 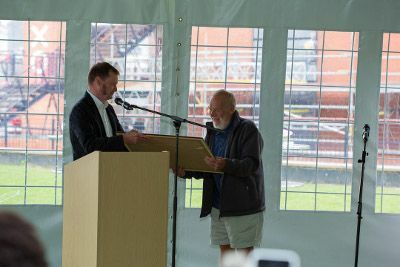 “Not many people can truly say ‘I changed the course of events’ but this beach is a living testament to Ernie's efforts over many years” says George Nicholson, Treasurer, Coin Street Community Builders and Chair, London Rivers Association 1987-2007. “Today’s announcement is a fitting tribute to an individual who has influenced how Londoners and visitors to London perceive and use the river today. 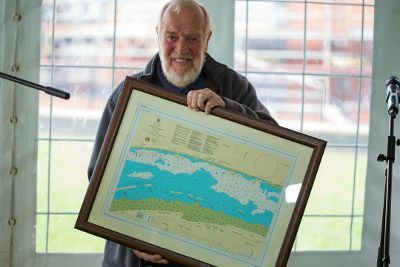 We are delighted the Port of London agreed to the naming of Ernie’s Beach, and that we are celebrating this during Totally Thames, a month long season of river-related activities,” adds George. Ernie has lived in the local area for 50 years and until recently was a regular mud lark on the foreshore. A printer until retirement, Ernie was a founder member of CSCB and also served on the boards of other local community organisations including Blackfriars Settlement, Waterloo Community Development Group and Association of Waterloo Groups. Ernie is lifelong President of the Colombo Centre. Port of London Authority advice on foreshore access. The Thames foreshore is potentially hazardous and some dangers may not be immediately apparent. The Thames rises and falls by over 7m twice a day as the tide comes in and out. The current is fast and the water is cold. Anyone going on the foreshore does so entirely at their own risk and must take personal responsibility for their safety and that of anyone with them.